Kalimpong Karate team has bagged first and second position in the Himal Terai Duars Sports Festival held at Darjeeling Zymkana Hall on 16th and 17th January. Darjeeling Gorkha Hill Karate Do School of Kalimpong players bagged 7 gold , 3 silver and 5 bronze making it the overall team champion in Karate Championship. Team coach Subham Khati today addressing a press meet at Reporters Kalimpong office informed our team contingent was of 28 players and 1 team coach and team manager. Our players performed excellently and won 7 gold medal which helps us to bag The Overall Team Championship Trophy. Apurva Pradhan, Pendamit Lepcha , Zerrad Lepcha , Diki Sherpa , Pratik Rai , Salom Tshering Lepcha and Tashi Sherpa won the gold medal for the team. He said we are very happy , our team will be awarded by CM Mamta Banerjee on 22nd in a program at Darjeeling. Meanwhile GTA united karate association of Kalimpong became second in the Karate Championship in addition association player Sangam Rai bagged the best fighter trophy in the festival. Milan Rai the team coach addressing the press here informed that the team bagged 6 gold’s, 12 silver and 10 bronze with a total of 28 medals. Sangam Rai will be awarded a Bike for winning Best fighter among 786 participant from Different region of Darjeeling District he added. Team players Sangam Ra , Richen Sherpa , Milan Rai , Nilam Lepcha and Abhishek Dungana won the gold medal. 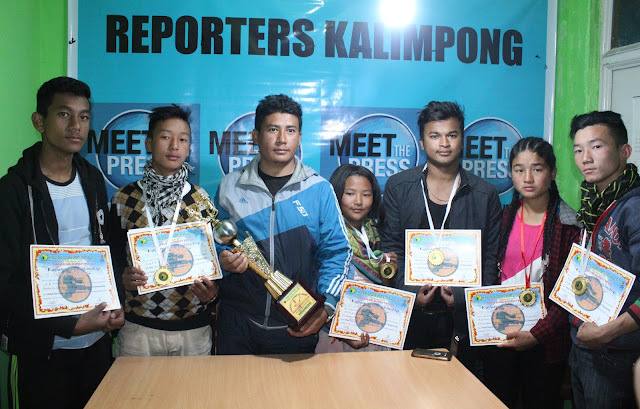 0 Respones to "Kalimpong Karate team rules in Himal Terai sports"